It was a historic weekend for UTSA as they routed division-favorites Southern Miss, 55-32, breaking numerous school records in the process. Led by running back duo Jalen Rhodes and Jarveon Williams, the Roadrunners averaged 11.3 yards per play in the contest – a number that hasn’t been hit in FBS play since 2013 when Florida State averaged 11.6 against Syracuse on the way to a National Championship. Redshirt freshman Josiah Tauaefa was named Conference USA Defensive Player of the Week after recording 12 tackles and the first interception of his career. Tauaefa is tied for the third-most tackles per game in the FBS, and is on pace to be a shoo-in Freshman All-American. 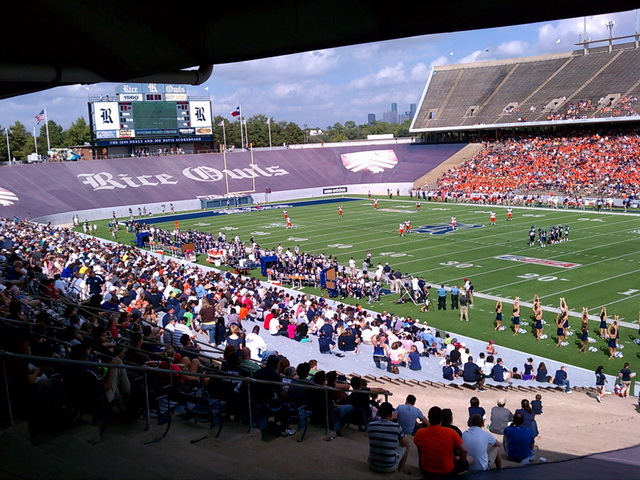 UTSA (2-3, 1-1 C-USA) will look to carry that momentum into this weekend’s game at Rice (0-5, 0-3 C-USA), the last remaining winless team in the league, as the Roadrunner faithful make their biennial pilgrimage down I-10 to paint Rice Stadium orange. The UTSA volleyball team’s nine-game winning streak finally came to an end this weekend as they lost their lone match of the week at Marshall, three sets to two. The Roadrunners (3-1 C-USA) will look to get back on track this weekend as they travel to Murfreesboro on Friday to face Middle Tennessee (1-5) before a quick turnaround for a home game on Sunday against UTEP (2-3). In their first game of the weekend, the Roadrunners fell to Rice 3-2, squandering a 1-0 lead at halftime. Both goals were scored by defender/forward Alexis Alaniz, helping her to become the Conference USA Defensive Player of the Week. After giving up 2+ goals in seven straight matches, UTSA’s defense hit their stride at just the right time in the second match of the weekend, recording their first shutout of the season in their 3-0 victory over defending conference champions North Texas, handing the Mean Green their first loss in conference play this year. UTSA’s first goal was scored by senior Brianna Livecchi from 25 yards out, officially assisted by goalkeeper Hannah Weisse, who booted the ball downfield before being mis-hit by a North Texas defender and blasted past the goalkeeper by Livecchi. Norwegian forward Kaja Skare put the final nail in the coffin, burying a penalty in the 82nd minute following a handball in the box. It was her 7th goal of the season, just three goals shy of the UTSA record set by Allison Dillon in 2007. The Roadrunners (6 pts) will kick off a three-game road stretch this weekend with games at UTEP (6) on Friday and bottom-of-table UAB (4) on Sunday. Brian Price was inactive for the Packers last weekend, and David Morgan II remained sidelined with an injury, leaving Teddy Williams as the lone UTSA representative in NFL action last weekend. Williams’ Panthers fell to Tampa Bay, 17-14, with the former track star appearing on a season-high 32 snaps. Former UTSA golfer Johan Edfors won the Terre dei Consoli Open on Sunday, finishing 13 under par. It was the fourth Challenge Tour win of his career, and puts him 33rd in the Road to Oman rankings. It was a record-breaking day for UTSA in their 55-32 victory over Southern Miss on Saturday. Running back duo Jalen Rhodes and Jarveon Williams led the way in UTSA’s first conference win in the Wilson era, and became the first 100-yard rushing pair in school history.